For part 4 we take a look a couple of exciting new directions that #3DPrinting is taking. Whatever you may think of additive manufacturing there is no turning the clock back, the world is completely moving towards #3DPrinting and it is just a matter of time until #3DPrtining is a viable option for mass production. Below are a couple of links to recent headlines and my opinion on these headlines. With these new #3DPrinting processes the future of manufacturing is truly living or starting to live in 2019. Printing metal parts with no layers? A new patent has been filed on this very potential. Printing via volume rather than layers. Printing via geometric shapes rather than layers. The big promise of this kind of #3DPrinting is improved part strength and smoother surface finishing. If what is described in the patent can be brought to fruition then this is a significant step forward in the #3DPrinting of metals. How does it work? Using magnets to suspend metal particles, forming them into geometric shapes. This volume if material is then all fused together to form a single block. Industries like Aerospace are already using 3D metal printing for some parts but the truly unknown with metal #3DPrinting (in my opinion) is how critical aerospace parts will fare under tremendous stresses over a prolonged period of time. Any advancement in #3DPriting parts with improved strength and surface finishing is a huge leap forward for the entire industry. This future is not quite living in 2019, let’s just call in conceived for now. Printing with light? Imagine being able to print 100 times faster. Well, that is the claim and perhaps the reality with this new #3DPrinting technology. How does is work? Imagine a vat of liquid resin that represents a volume. Within that volume light is emitted to form geometric patterns. Where the light shines the liquid resin solidifies to create parts. More complicated than that but that is the gist of it. This is being heralded as an advancement in #3DPrinting but it sounds more to me like a new category all on its own in the field of additive manufacturing. A rapid manufacturing option that doesn’t require a tool or a small army of 3D printers to get a low-volume production job done. 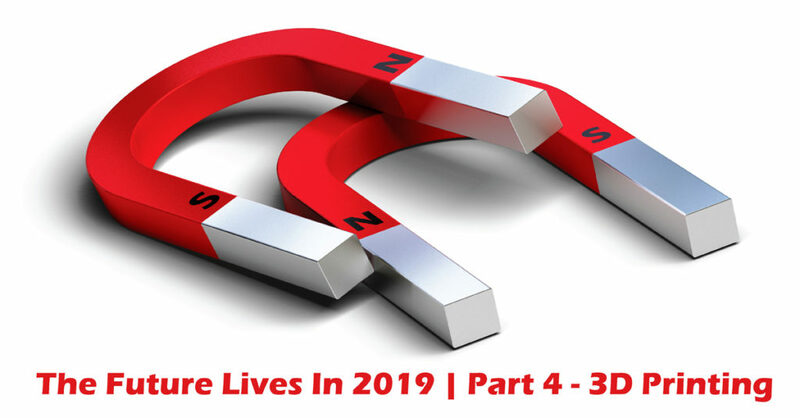 With so much happening in the world of #3DPrinting this will not be the last mention of 3D printing in our 19 part series on the future living in 2019.